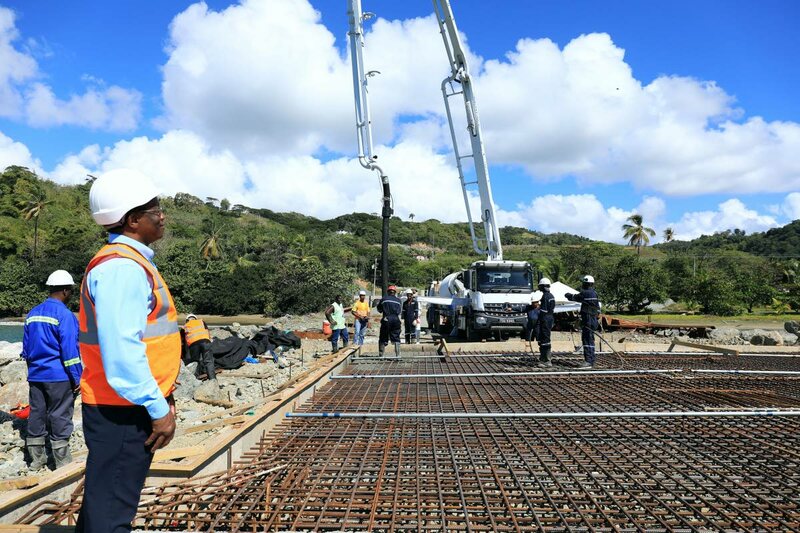 General Manager of the Studley Park Enterprise Limited (SPEL), Dexter East, looks on as workmen get the cement pump going at the Barbados Bay jetty rehabilitation project at Studley Park on Monday. 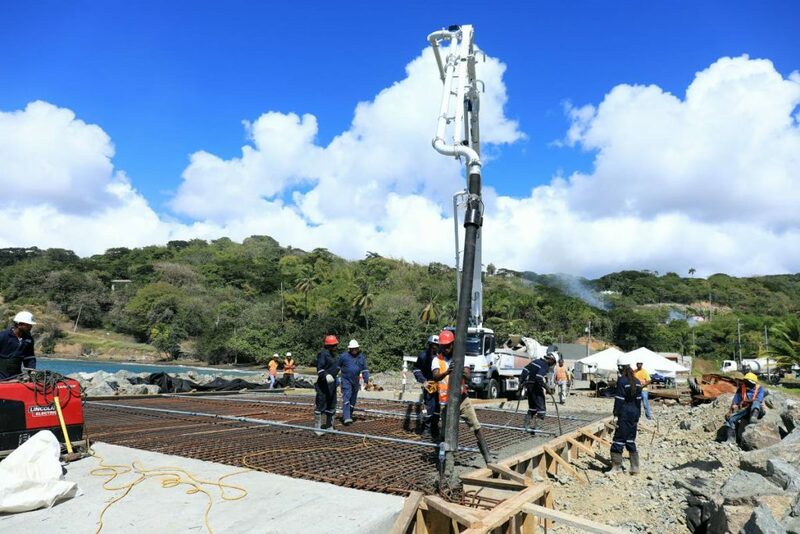 Rehabilitation of the Barbados Bay Jetty at Studley Park is expected to be completed this month with 97 per cent of the work done, and a release from the Division of Infrastructure, Quarries and the Environment announced on Monday. The Division said the jetty on Monday received its second concrete pour, this time for the casting of the apron - the approach to the ram, which was formed just days after the New Year. It said the project would boost economic activity for the Studley Park Enterprise Limited (SPEL) and the construction industry at large. The facility would allow for the berthing of barges for the transportation and export of aggregate and the importation of other construction material. A worker guides a concrete hose for casting of the apron/access to ramp at the Barbados Bay jetty rehabilitation project at Studley Park on Monday. The Division said last month that the Certificate of Environmental Clearance (CEC 5449/2018) for the refurbishment and expansion of a loading jetty at Barbados Bay was issued to SPEL by the Environmental Management Authority (EMA) on November 12, 2018. It said the CEC comes under Activity 13a of the CEC Rules which covers coastal or offshore construction or modification and dredging activities and that RJB Building & Civil Engineering Contractors Limited, contracted under a design-build arrangement, was fully mobilised to implement the project on behalf of SPEL. Reply to "Jetty rehabilitation nears completion"